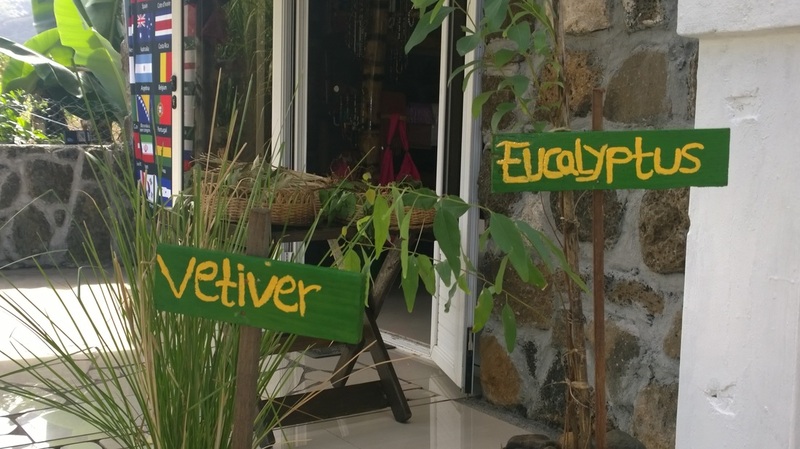 Visit our Mauritian Boutique Typique "Vallée de Ylang Ylang" situated at the foot of Lion Mountain, on the S.E coast of the Island. 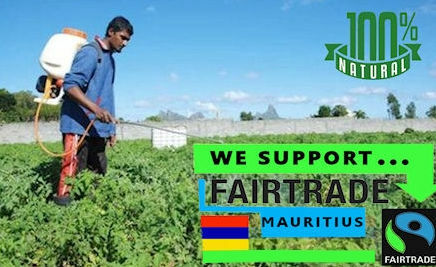 A small business enterprise; supporting Mauritian essential oil producers, natural cosmetic makers, artists and craft makers. Our Boutique sells Ylang Ylang essential oil, skincare products and handicrafts. Natural Skin Care Creams including our "L'escargot Snail Creme"
Ylang Ylang essential oil is distilled from the flowers of the endemic Ylang Ylang tree and is used in aromatherapy. Ylang Ylang has been used for centuries in religious and wedding ceremonies. 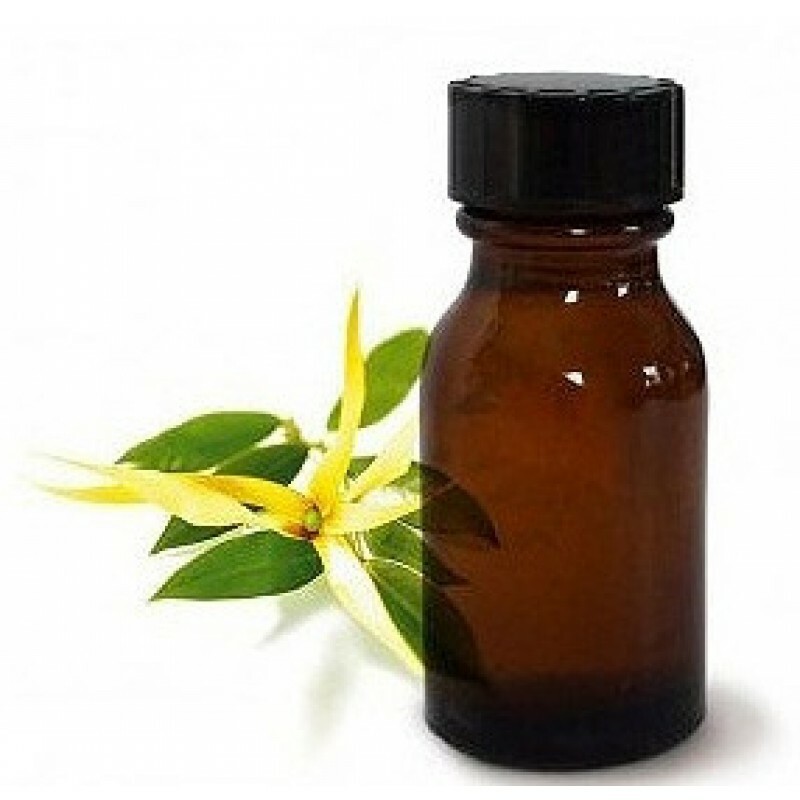 In aromatherapy, Ylang Ylang is used to lessen tension and relieve stress. Ylang Ylang may be applied to the scalp, to promote luxurious hair. 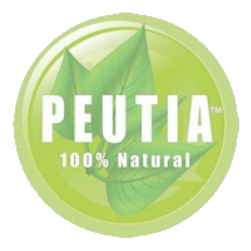 We add it to our natural skincare products for its scent and nourishing and protective properties. Ylang Ylang can also be taken internally because of it's antioxidant properties. We stock an extensive range of hand made necklaces and bracelets. The costume jewelry is individually made by Maryline. Beads are from locally sourced materials, including berries seeds, coral,shells and coconut shells.The time consuming work produces unique pieces, which are competitively priced and make a beautiful souvenir or gift. Alternatively treat your self and wear your necklace whilst on the beach to compliment your sarong, or as informal evening wear . Snail cream is a skin care product derived from snail secretion. While it may not sound pleasant, snail secretion possesses medicinal properties and treats a variety of skin conditions. Our locally produced L'escargot Crème is 100% natural and has no harmful chemical preservatives. This best selling Snail Cream is distributed in a 100ml.pot - which is twice the size of our competitors. The cream is available in our Boutique and also sold world-wide from our online store. EcoNaturalSkinCare. Vanilla beans are pleasantly fragrant fruit pods obtained locally in Mauritius and from our own garden when available. 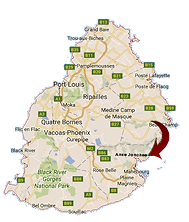 This highly prized bean is cultivated here in Mauritius as the climate is beneficial to its growth. The tree is fairly easy to establish,although it is a difficult to pollinate the flowers (which are individually pollinated by hand) to increase the success rate. Vanilla beans are one of the most expensive spices, used especially as a flavoring in wide array of sweet-drinks and confectioneries. ​Its health benefits include help in enzyme synthesis, nervous system function and regulating body metabolism. Controlling heart rate and blood pressure. Not only do we cultivate herbs and plants for use in the manufacture of our Natural Skin Care products, we also grow young potted plants for transfer and planting out in your own garden. We are certainly not a fully blown garden centre, but we do have a healthy stock of young plants including herbs, palms, coconuts and Aloe Vera. Each plant is lovingly grown from seed, cuttings and dry coconuts by our green fingered gardener Patrick - who is here to advise you on Mauritian flora. We stock and sell raw organic honey, which we source from Mauritian beekeepers, indeed we have recently joined the ranks of local beekeepers and we have limited availability of both honey and wax from our own hives. Organic raw honey is a healthier choice as it's tested to be free of pesticides or environmental pollutants and most importantly it tastes better. Most of the honey that you buy in stores is not real honey, so you may be missing out on it's incredible benefits and superior taste. We stock and an attractive range of local Mauritian art, both paintings and coconut craft work. Paintings available include copies, prints and individually painted canvases and art painted on slates coconut shells. 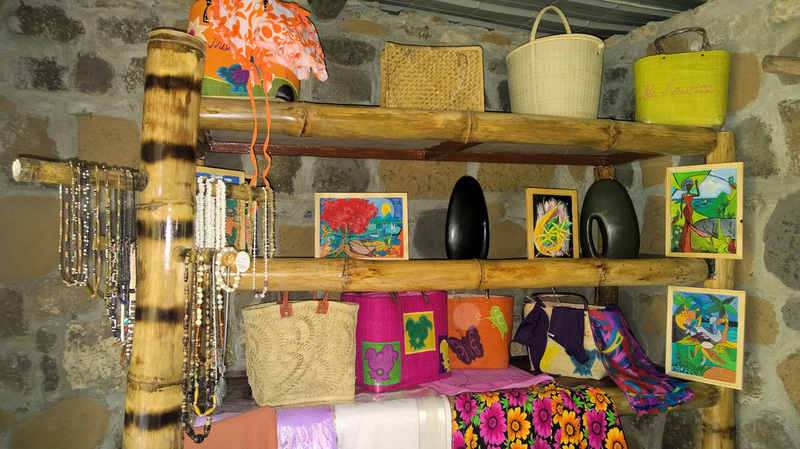 The colourful tropical simplicity of the art work, make for unique souvenirs and gifts to take home. Display them in your house and have a permanent reminder of days spent relaxing in the sun. A topical hat is a wonderful accessory, which is both stylish and essential to protect men,women and children from the hot tropical sun. Take a tip from the locals stay protected.The range of hats we stock are colourful and handmade and come in all sizes including children's. Buy them to wear during your holiday and take them home as a souvenir to remind you of happy days spent relaxing in the Mauritian sun . Ask any lady - a hand bag is a must have accessory. So while you are here on holiday grab the opportunity to buy a unique stylish practical souvenir. Our stock of locally hand made bags are suitable for using on the beach, a trip to the local store (no plastic bags used in Mauritius). 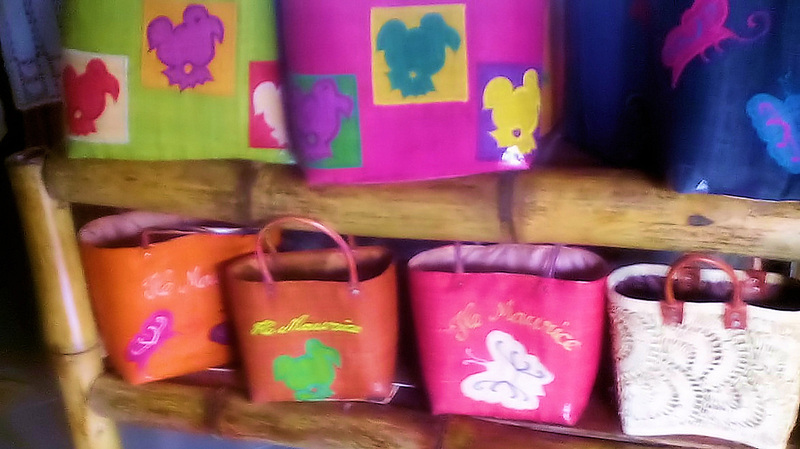 The bags weaved from the magic hands of artisans are colourful or discreet designs, using natural materials. For a dramatic fashion statement, simply throw on a pashmina scarf. These luxurious scarves can cost a pretty penny, but luckily we stock some fabulous imported pashminas that cost a fraction of the price you would pay outside of Mauritius.The multi-functionality and glamour of pashminas make them a must have accessory for evenings out on your holiday. They also make great holiday gifts and souvenirs.